Guten Tag von Deutschland! Clint and I are finishing up our vacation later this week and are looking forward to seeing you next at 10 AM, Sunday, August 19 for an informal worship service in Hayden Hall. We are staying with former neighbors in the same rural farming village where we lived from 1996-1999, when Clint was in the Army. Massweiler has a beautiful church in the center of the village, and church bells ring to regulate village life, at least ostensibly, just as they have for centuries—even though Europe in general grows increasingly post Christian. Bells ring every fifteen minutes to mark off time. They ring to call the faithful to mass as well as to weddings and funerals. Three times daily they ring in a distinctive way to call people to prayer—at 6:45 AM, at noon, and at 6:30 PM. But almost no one ever stops at those times to pray. Almost no one goes to mass, which is now only held two Sundays per month in response to the limited demand. Similarly, our communities at home are regulated less and less by the life of the church. Mainline Protestant churches have thinned significantly— and evangelical as well as Catholic churches are following suit, albeit at a slower rate. I find this sad, frankly. As Europe and America grow increasingly secular, we lose sight of Spirit and forget that we are first and foremost souls on a journey through this material world. Worship and prayer, however, remind us of what (and Whose) we truly are. Tonight when the prayer bells ring, I will pause to remember that I have a soul. May we all take time to worship and pray. Taking Along Too Much Baggage! As I am missing you all this summer, I pray for you daily. We are all so saddened by the passing of our beloved Jerry Sytsema. On Sunday I spoke with Gail at her summer home in Maine, and she is having her ups and downs, as anyone who has walked the path of grief well knows. She is grateful to have her family around her. Jerry’s celebration of life service will be at Deer Isle Sunset Congregational Church in Maine on August 3. Our own Bob Simington will attend. I thought it would be nice if we could share some memories or thoughts about Jerry and have Bob or the officiating pastor read them at the service. Please email me a memory or anything you would like to say about Jerry ASAP, and I will compile them into an offering from CCOV. I look forward to being with you at 10 AM in Hayden Hall this Sunday, July 15. We will worship together informally and celebrate communion. If you would like to read ahead, the scripture is Mark 6: 1-13. I will be talking about “baggage.” Jesus orders his disciples to travel lightly when they go out proclaiming repentance, casting out demons, anointing the sick with oil and curing them. We will talk more about the baggage we carry through life and how having faith means worrying less about taking our own provisions. This may be helpful for all of us during the summer months of increased travel! I’ll see you all on Sunday! How I miss seeing you all, though it is good to have a break from driving for a little! Heartfelt thanks to Dorie for coordinating and to those who are participating and leading our Sundays in the Summer! I know many of you are as distressed as I am regarding what is going on at the border, especially with parents and children who have been separated. Committed Christians everywhere have been alarmed at this gross immorality and are calling on people of faith to help. Help can be in the form of calling our legislators or donating to organizations dedicated to supporting those seeking a better life. Caring for the immigrant after all is a biblical mandate! 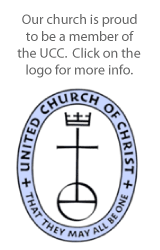 I encourage you to visit www.ucc.org to learn more about what is happening. Please watch the UCC Webinar video you will see there called “Keep Families Together.” You can also donate through links on the website. I look forward to seeing you all on Sunday, July 15 and will lead an informal worship/communion service. In the meantime, please keep me in the loop regarding any pastoral needs that come up. Happy summer! I hope all of you are enjoying (or getting ready to enjoy) your summer locations and vacations! For those of you who will be around, be sure to join us for Sunday mornings in Hayden Hall at 10 AM. Bring a snack or breakfast item to share and participate in meaningful discussions around the table. I will be with you on Sunday, June 10 and will lead an informal worship service in lieu of a discussion. If you want to read ahead for June 10, the scripture passages are 1 Samuel 8:4-20; 11:14-15. You will hear all about how Israel wanted Samuel to appoint a king over them so that Israel could be like “other nations.” Interestingly, God acquiesces but has Samuel warn the people about what they are getting into with such a governmental structure. We’ve been talking a lot about God and government lately and what God’s holy purposes for government are. In fact, I hope you picked up the “Reclaiming Jesus: Confession of Faith in a Time of Crisis” statement in the narthex last Sunday. If you did not, you can access this important confession, penned by many of our best current-day theologians, right here: http://www.reclaimingjesus.org/. Please stay in touch with me, especially regarding any pastoral needs, even though I will not be down every Sunday this summer. I can respond by phone, text, or email very quickly. Also, unless I am traveling, I can be down in the Valley in two hours. We are already moving into the hot summer! Many of our seasonal members have departed for their cooler summer homes, and many of our year-round members are looking forward to beating the heat on their summer vacations. Sunday, May 27th will be the last regular sanctuary worship until we resume again on Sunday, September 16th. For those who are around Sundays this summer, you are sure to be blessed by our more intimate gatherings at 10 AM in Hayden Hall. Folks recall fondly this format from last summer. Bring a snack or breakfast item to share around the table and enjoy discussion, fellowship, and programs that you may even feel the Spirit moving you to lead! If you have something to share or a discussion topic to lead, please speak with Dorie, who is coordinating Sundays in the Summer. You may also sign up to host the morning, which involves making the coffee and cleaning up afterwards. Ideas for programs include: My Faith Journey, My Experience with Grief Recovery, My Experience/Understanding of God, Coping with Change and Crisis, Dreams for CCOV, Sharing of Stories of Forgiveness and Reconciliation from our Lives, or possibly anything you may be thinking about. Feel free to bounce ideas off of me. I will be present Sundays June 10 and August 19 to lead an informal Hayden Hall worship service that will include communion. This Sunday, May 20th, is Pentecost, the birthday of the church. For those who like to read ahead, our scriptures are Ezekiel 37:1-14 and Acts 2:1-21. As I draw upon the accounts of Ezekiel and Luke’s Pentecost account in Acts, you will hear all about how Spirit-enjoined prayer is a powerful means of “calling forth.” Indeed, the Holy Spirit, with which we are filled, makes all things possible. The Spirit makes dry bones get up, it enables understanding, restores, brings together, empowers, changes our lives and makes the unexpected happen. And then on Sunday, May 27th, we celebrate Trinity Sunday and will explore the mysteries of the Trinity, God’s model of community for us. Our scriptures May 27th will be John 3:1-17 and Romans 8:12-17. I look forward to our coming Sundays together! Happy May! Three of us just attended the UCC Southwest Conference Annual Meeting at Rincon Congregational UCC in Tucson as your delegates this year. I want to give you a brief recap of what we learned, and I hope you will talk to us in person if you have more questions. All day Thursday, April 19, 2018, I attended a workshop entitled Faith-Rooted Organizing, led by Rev. Dr. Alexia Salvatierra, a national leader in the areas of poverty and immigration. She is a Lutheran pastor with more than 35 years of experience in community ministry and co-author of the book, “Faith-Rooted Organization: Mobilizing the Church in Service to the World.” I want to read her book, and I highly recommend that you do too, because what she has to share is of utmost importance to the kin-dom of God. Rev. Dr. Salvatierra provided an excellent theological framework for God’s people to organize to defend the poor and marginalized and advocate for social justice, based on Luke 9:14: “…organize them into little communities.” With the premise that all of us want abundant life for ourselves and others, no matter where we are on the political spectrum, she shared that we need to have a vision for a just world, and that we can work toward this when we organize our gifts and mobilize for action. I hope to incorporate much of her thought into a sermon later this May. We attended ALICE Training together on Friday, April 20, 1918. ALICE stands for Alert, Lockdown, Counter, Evacuate, and it is offered by the ALICE Institute to protect institutions from active shooters. While the odds of something happening at CCOV are statistically very low, shootings in churches as well as schools and workplaces are on the rise. The tragic events last fall at First Baptist Church in Sutherland Springs, Texas remind us that horror can unfold anywhere. Our council and congregation need to have conversations about how we would handle an active shooter during worship. There are indeed ways to increase survival. I’ve been giving a good deal of thought to this regarding our sanctuary’s set up. Please be reminded that there is a door behind the organ should there ever be need of evacuation. Additionally, distraction is a good technique—folks can throw hymnals, etc. to distract a shooter so that someone could take him or her down. We have much more to talk about, and a blurb like this is not really appropriate or adequate. We also attended the breakout session on proposed changes to the UCC Constitution. Our conference’s executive board voted not to ratify these changes, and delegates to conference agreed, voting overwhelmingly not to ratify them. This means we will continue to be in discussion about any changes. In short, this session dealt with clarity and inclusion language in the ministerial authorization section, full communion with UC-Canada, and governance changes. I do not have the space to discuss them all here, but you can read further at http://www.swcucc.org/conference-office-blog/2018/4/3/07rep4ylii5ebd5a6zaf45n40xuto4. If you do read this, keep in mind that covenant and autonomy have always been in tension in the UCC and that we have resisted the hierarchal polities that govern many other denominations. Please note that there will be no formal worship in the sanctuary starting June 3. We will resume regular sanctuary worship Sunday, September 16. Between June 3 and September 16 we will meet in Hayden Hall for potluck breakfasts accompanied by informal programs and worship. As always, I look forward to all of our times together! I hope you are all enjoying your first 100 degree day down in the Valley! It’s very springlike here in Prescott. The fruit trees are covered in pink blossoms, and I hear quail calls from sun up to sun down. Springtime is a reminder in the natural order that God is always at work making all things new. Speaking of seasons, I continue the Easter theme this Sunday of God at work resurrecting all things. I will be preaching on Ecclessiastes 3:1-15, and the choir will be singing “Turn, Turn, Turn” based upon this well-known scriptural passage. Come and hear about how all of us move through life’s seasons, some that are unpleasant and some that are pleasant. I will talk about the contrast the writer of Ecclesiastes sets up between life lived “under the sun” and life lived “under heaven” and what a world of difference living life “under heaven” can mean for the believer! Prayers for a blessed, faith-enriching Holy Week. I look forward to seeing you all Easter Sunday when the sanctuary will be fragrant with Easter flowers and filled with the beautiful music of Katarzyna Honsberger and our own Larry Loeber! My Easter sermon’s title is “God’s Work: Resurrecting All Things,” and the scripture readings are John 20:1-18 and Revelation 21:1-6a. I encourage you to read ahead. You will hear all about how God is actively at work in nature and in our own lives, making all things new and resurrecting all things—both in the present and for all eternity. Don’t forget that the following Sunday is Holy Humor Sunday, so please get your (clean) jokes ready to share during worship. In the same vein as Easter Sunday, I’ll endeavor to preach (humorously) on how God is actively at work even amid all the brokenness we see and experience and why we can always have hope. One such example is how the Spirit is working through this church in the repairing of air conditioners, sidewalks, roofs, and plumbing. I so appreciate all you are doing to keep the campus safe and comfortable for our congregation and for the Montessori School that we are soon to host! I look forward to celebrating the resurrection with you!